'Buddy' is the new everbearing strawberry that is taking the supermarket world by storm. 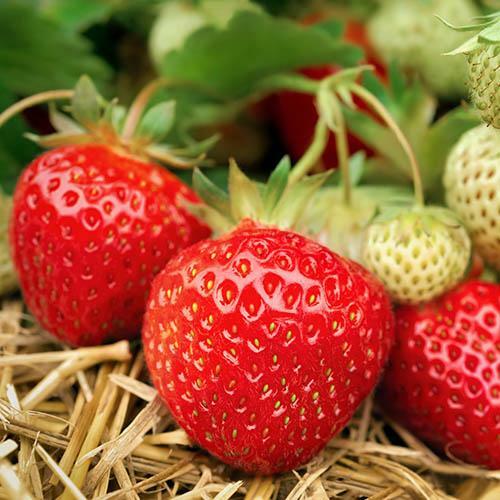 Everbearing Strawberries are great for spreading strawberry fruit production out, fruiting right into Autumn. It produces big fruit with great taste, and is the sweetest of any everbearer to date (winning many taste-tests). Supplied as a pack of garden ready plants 6-cm rootball diameter, ready to plant staright out and fruit this Summer, into Autumn. 'Buddy' is the new everbearing strawberry that is taking the supermarket world by storm, and 2014 is the first year it has been offered to home gardeners to grow themselves. Everbearing Strawberries are great for spreading strawberry fruit production out. Starting slightly later than the Wimbledon peak, they have a big yield in mid to late July, but then keep going through August - peaking again in September and continuing to crop until first frosts! This makes eating and using the crops easier, not one huge glut! Everbearers have historically not been quite as good on the taste scores as traditional 'June bearers', but 'Buddy' breaks the mould here. It produces big fruit with great taste, and is the sweetest of any everbearer to date (winning many taste-tests), hence its popularity with supermarkets. And it is a great cropper too - commercial trials showed almost 1Kg per plant in year 2 and 3 (just over 2 pounds per plant). 'Buddy' also has good mildew resistance too, so suits home garden production, where none of want to use chemicals if not needed. Let Buddy become your best friend in strawberries this year. Supplied as a pack of trayplants 6-cm rootball diameter, ready to plant staright out and fruit this Summer, into Autumn.